14 1/2 by 20 1/2 in. Now I also have a large Heilbuth in duplicate, By the water’s edge, the figure of a lady, she’s sitting on part of a tree-trunk... it’s very beautiful. 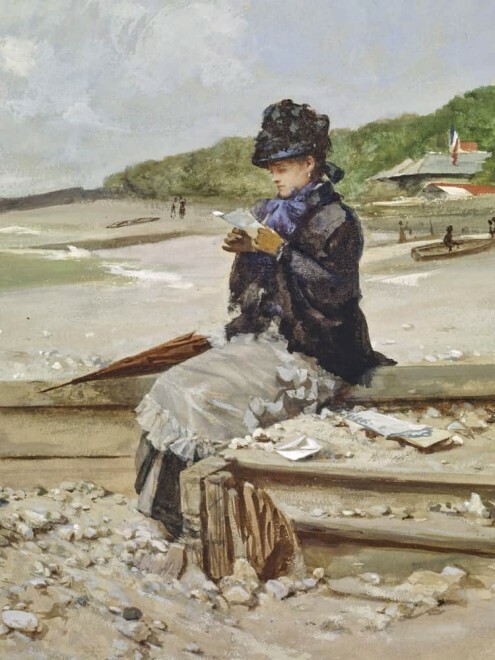 The Channel coast provided subject matter for French artists throughout the 19th century. In the early to mid 1800s, the attraction was the rustic fishing villages with their local population, as depicted in works by artists such as Eugène Isabey. However, with the rapid expansion of the French railroad system during the Second Empire, access to coastal towns became easier and less expensive, resulting in rapid development of the tourist industry for not just the affluent, but also for the middle class. 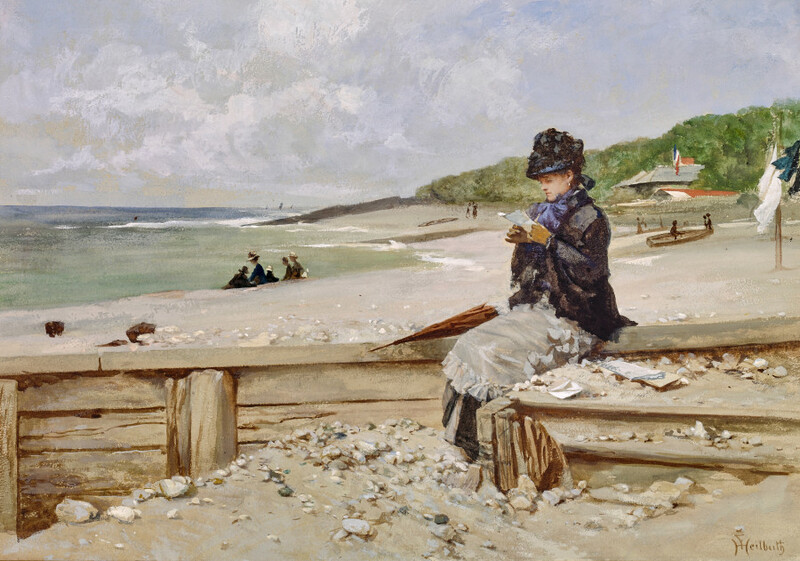 Beachside resorts sprung up in nearly every channel town, and the influx of summer vacationers provided new subjects for the next generation of painters led by such artists as Courbet, Monet and Boudin. 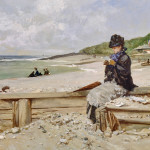 It was in the early 1870s, possibly at the urging of his close friend, Edouard Manet that Heilbuth turned his attention to contemporary scenes, and Woman Reading at the Seashore most likely dates from this decade. 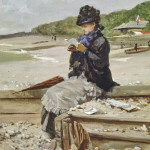 As was the fashion, she wears a coat and hat to shield her ivory complexion from the sun; her parasol is left momentarily unfolded by her side, freeing her gloved hands to read a letter. Other vacationers sit on the beach or pull skiffs to shore, and small sail boats can be seen on the horizon. The sky, the sea and the pebbled shore are especially naturalistic, made all the more convincing by Heilbuth’s mastery of the watercolor medium.